The St. Louis Blues shook up the AHL landscape a bit on Friday when it was learned that they were going to opt out of their final two years in Peoria and move their AHL team elsewhere for the 2013-14 season. According to the rumors, the Blues will sell their franchise in Peoria to the Vancouver Canucks, who will then leave their current affiliate in Chicago for another site, rumored to be Abbotsford, BC-- which is currently home of the Calgary Flames affiliate-- the Heat. Then the Blues would move to the old Canucks affiliate, the Chicago Wolves-- who will run and operate the team for the Blues. As for the Flames-- they've been rumored to go to Utica for their AHL affiliation. Confused enough?? Good-- that's the life of the minor league Silly Season when it comes to affiliations and where teams want to have their prospects. There are quite a few NHL teams that actually own their AHL affiliate, so when they pick a spot-- they better enjoy it for a while because odds are they'll be there for the long haul. Even so, for fans in cities where they connect close to the minor league team-- it's a stressful part of the year not knowing how many of the guys who are there this year will be playing there next year. That's just a testament to the die-hard nature of minor league fans, who stick by their city for whomever could be their affiliate. The Norfolk Admirals were the Tampa Bay Lightning affiliate last season, won the Calder Cup, then this season-- the Bolts moved out of town and the Anaheim Ducks are the new affiliate there, but the fans have continued to come (5,119 in 2011-12; 5,403 to date for 2012-13) even with the new faces that have shown up. Conversely, the Bolts new affiliate in Syracuse have maintained the attendance, as well (5,246 in 2011-12; 5,388 to date in 2012-13). It doesn't mean it's not as hard for the fans emotionally in terms of letting go of a group of players or affiliates or the team themselves. 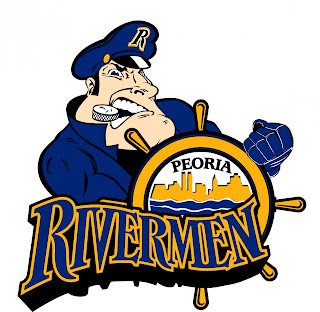 The Peoria Rivermen name has been around the city since the 1984-85 season in different leagues. 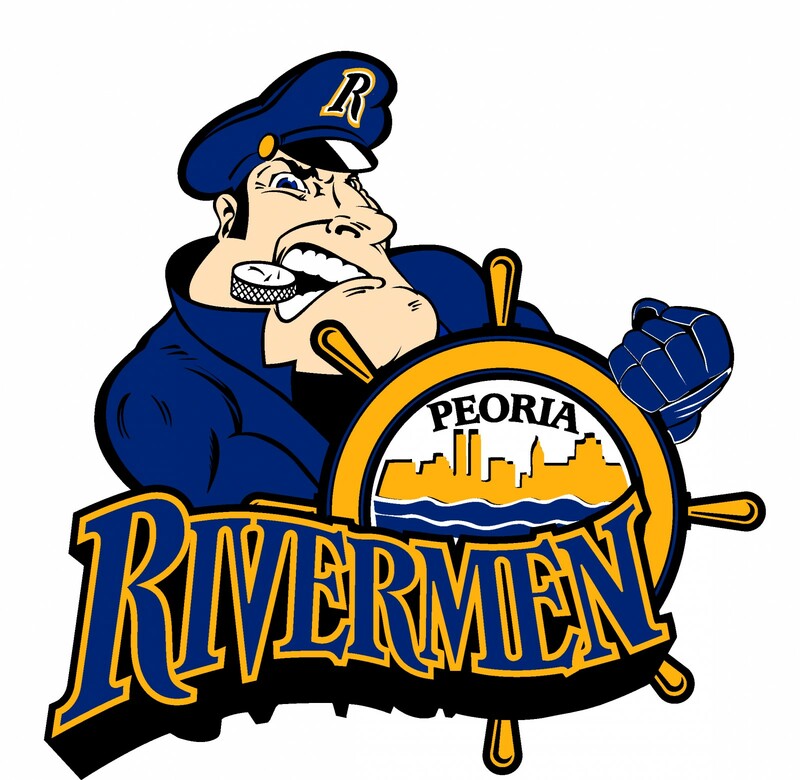 For fans of the identity are probably hoping for the best that an ECHL or other minor league team will come through for the city to keep the Rivermen name a mainstay in the area. Regardless of how the parent teams act, many players are as connected to their minor league city through doing community work at schools, health care facilities, and other ventures that allowed the players to reach out and connect to the community. You can bet some of those guys are just a shook up as the fans. Yet, that's the nature of the business. You have to make sure you take care of your minor league team's travel, budget, and all that stuff-- on top of managing prospect development and the NHL side of things, too. Sometimes dollars don't add up and you have to move around the US and/or Canada to find the right spot....or the right spot for right now. In the midst of all the Jarome Iginla craziness, the NHL did the smart thing and snuck a Phoenix Coyotes update in the middle of the whole ruckus. With this announcement, the big thing that Bill Daly actually admitted is that it's almost the time for relocation-- specifically Quebec City, Seattle, and the dark horse to end all dark horses, Kansas City. With the NHL saying they will talk to the players about it before the playoffs, as well as keep the line open to investors-- we could actually be heading towards an end game. Of course, you have the front runners that are going to be Quebec City, who's arena is planned to be built by opening night of 2014, and Seattle, who will probably get an arena based on what happens with their NBA cohorts. However, the inclusion of Kansas City is an interesting one. Considering the AEG contingency own the Sprint Center and many owners wouldn't want to pay rent on it-- it leads me to believe that if there's some inkling of an ownership, Kansas City could steal this relocation. The reason I think this is almost geographical. Consider the fact that the NHL probably won't go to Seattle if the NBA doesn't go there because it seems the NBA is the end all be-all for getting a new arena in that area. Also, take the point that Quebec City is out East with the Coyotes out west; the crazy realignment that has taken place already would be ruined. 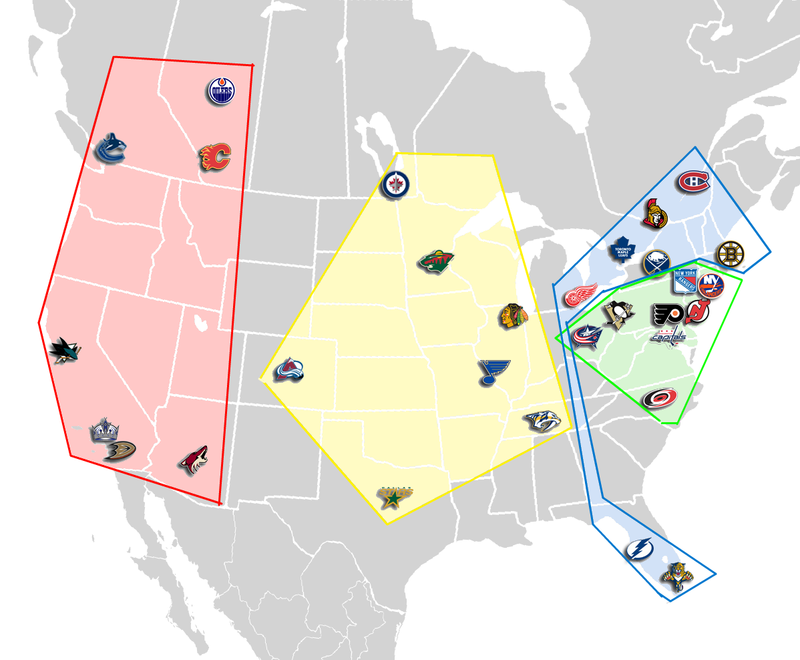 All this mean is that should the Coyotes move to Kansas City, it wouldn't completely break the realignment up and maybe allow Colorado to move to that more west division. Granted, should Seattle actually get the Sacramento Kings (a decision to come by early to mid-April), then the obvious choice outside of keeping the team in Phoenix would be Seattle because it keeps that division together. One hurdle is whether or not the NHL thinks that the Key Arena is able to hold a hockey team in the meantime. Also should be noted that many believe that Quebec City could and should be the front-runner thanks to the success that Winnipeg brought back to their area of the hockey world with the Thrashers moving to become the Jets. Even so, that whole realignment thing could really screw Quebec's chances now more than ever. You can't just move the Coyotes out east and realign again without screwing over the Red Wings or Blue Jackets, as well as making the Blue Jackets a target for relocation in the next five years, possibly. Kansas City has often been a rumored site, especially since Mario Lemieux leveraged a visit to Kansas City in order to get a new arena in Pittsburgh, as well as the Predators being rumored to go to Kansas City during their turmoil in 2007. Yet, like I alluded to earlier, the fact the owner would not own the actual building may be the hurdle that KC has to overcome in order to fill that vacant arena. It is the second smartest move after Seattle if we're looking in terms of realignment, but the lack of the building ownership would be a huge turnoff. However, this is all just speculation. The NHL is still fielding local ownership ideas first, which means the joy that is Ice Edge Holdings leader Anthony LeBlanc has re-emerged to look at buying the team and is working with Alberta investment banker George Gosbee to work out a deal for the team and then with the City of Glendale for leasing, which won't be an easy task. I wonder if other former suitors will come back into the fold again...but who's to say they will be as welcomed as they were in the past. In a deal that has gone on two years too long, there's still not a clear finish line up front. For some reason, no one wants to let the Coyotes go to a new destination, but no one is working that hard to keeping them in the place they're at now. It's quite the rock and hard place that the NHL has gotten into; which is almost of their own making. Stalling on things doesn't make them magically disappear-- just get more troublesome with time. As the NCAA Selection Sunday for hockey was named yesterday, this week's AGM was a stud in the college scene in his time, while being recognized for his short-tenure as a goalie of the decade. While his NHL career was short-lived, he'll forever live in the memories and record books of the fans of the 1970s. This week, the profile of Bruce Bullock. Bullock first came onto the scene with the Clarkson University Knights in the 1968-69 season, where he would play in 28 games and finish with a record of 19-7-2. During the 1969-70 season, Bullock had a huge year going 25-2-0 in 27 games, helping lead Clarkson to the NCAA Finals, losing to Cornell. However, Bullock was named to the All-Tournament Team and the NCAA East All-American Team. For the 1970-71 season, Bullock played amazing again-- posting a 28-1-1 record in 30 games, leading Clarkson to the ECAC title game, but lost to Harvard. Despite the loss, Bullock was against named to the NCAA East All-American Team, as well as the ECAC First All-Star Team and ECAC Player of the Year. He was named to the ECAC All-Decade Team for the 1970s. Bullock left Clarkson and signed on with the Chicago Blackhawks starting in the 1971-72 season. While demoted to the Central League's Dallas Black Hawks, Bullock went 0-2-1 in five games before Chicago would sell his rights to the Vancouver Canucks. Bullock moved to the Western League to play for the Seattle Totems and would finish the 1971-72 season with a 3-7-0 record in 10 games there. Remaining in Seattle for part of the 1972-73 season, Bullock posted a 7-6-0 record in 13 games. Bullock would be called up to Vancouver due to injuries and would finish with a 3-8-3 record in 14 games. The 1973-74 season saw Bullock back in Seattle, putting up a 22-20-3 record in 46 games with the Totems, while in the 1974-75 season, Bullock posted a 14-20-7 record in Seattle, then losing his only appearance in Vancouver. During the 1975-76 season, Bullock played first for the North American Pro League's Beauce Jaros, playing in 19 games before catching on with another Central League team, the Tulsa Oilers. With the Oilers, Bullock when 13-3-0 in 17 games and a perfect 6-0 in the playoffs to capture the Adams Cup. At the end, Bullock won his last eight regular season games and all six playoff games-- the longest win streak for an Oilers goalie until Rod Branch broke that record in 2002. Bullock stayed in Tulsa for the 1976-77 season, putting up a 20-14-6 record, then 4-4 in the playoffs; while also appearing in a game with the Canucks, which was a no-decision. 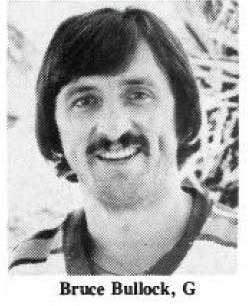 The Pacific Hockey League was Bullock's last destination, playing with the Phoenix Roadrunners in the 1977-78 and 1978-79 season for a total of 62 games. In the 1977-78, Bullock was named to the Second All-Star Team. After this, Bullock retired. While his promising college career was not indicative of his professional success, what he didn't get in the NHL, he made up for in the slightest for his minor-pro career. With a record that stood for 26 years, Bullock can rack up his lack of NHL prowess on an expansion team and too many cooks in the front office kitchen. 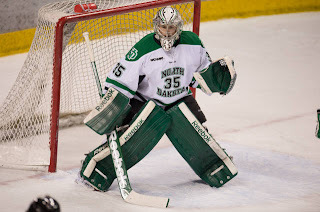 Back in November when I talked to University of North Dakota's goalie coach Karl Goehring about third-string goalie Tate Maris, I asked about whether or not we would see a "Rudy" situation with Maris getting into a late season game. When chuckling about the notion of it, Goehring replied: "Not my call, but try to make sure we take care of Tate as much we can because we really appreciate what he does." And that's what UND did on Sunday. With 4:08 remaining in a 5-0 game-- which would be the clinching game for UND over Michigan Tech-- head coach Dave Hakstol pulled Clarke Saunders and put Maris in-- his first regular season action in his four years at UND. While he only made one save, he shared a shut-out with Saunders in the game, the first for UND since 2003 when Jordan Parise and Jake Brandt recorded on against Yale. "Easy decision," said Hakstol when asked about putting Maris in. "Tate means an awful lot to the guys in the locker room and a lot to the program. He's earned more than four minutes in his career. He's important in our locker room, he's a leader, and you can see how hard the guys played in front of him how much he means to the program." While Maris is more known for his wit on the UND web-show Brad Miller Time, as well as his musical career-- the hard-work and upbeat attitude has made him a fan favorite and a favorite of his teammates in the room. "You can't put a price on a guy like Tate Maris and what he does. He shows up to work everyday, loves being a part of the team, and has the most diffcult role on the team. When guys see his positive attitude and his approach, it rubs off on everybody," said Goehring in November. As a walk-on to the team, Maris had the uphill battle-- especially for not playing in the 2008-09 season. He was suited up for five games in his freshman year of 2009-10, but didn't make an appearace. In fact, he didn't see any game action until his junior year of the 2011-12 season, stopping all six shots in an exhibiton against the Russian Red Stars. A smaller goalie at 5'9 also had Maris some disadvantage trying to get his spot and playing time from Aaron Dell and Brad Eidsness for his first three years, then Saunders and Zane Gothberg this season. But Maris kept at it. He focused on his accounting major and was named to the WCHA All-Academic Team all four seasons. Also in his freshman year, Maris won UND's Most Improved Player award. As mentioned, it seemed his wit and joking manner provided an upbeat attitude for him. So much so that he is quite the follow on Twitter (where he documented UND getting stuck in Summit, South Dakota and talked about going to play goalie for University of Phoenix). After the game, he got his first ever media scrum. "It's indescribable. I'm kind of at a lost for words now. Four years pushed into four minutes, it's pretty surreal, to say the least" said Maris. "I tried to block them (the fans) out and try not to let it get into my head, but it was pretty exciting. I was very thankful for that." When asked about if he was concerned having forward and Hobey Baker Award hopeful Corban Knight on defense, Maris quipped, "I was extremely worried. I was battling to help Knighter through the year." Knight tried to turned the tables, asking Maris about bobbling his shot, "There was a huge screen in front of me, guy about 6'7-- but I fought the screen, fought the rebound to get the whistle and get a rest for guys like you." Through and through, with hard work and determination and pretty much not letting anything get him down, Maris got a four-minute stint that will probably last a lifetime to him, those there, and to his teammates who saw four years culminate into one small stint. "As a player it's awesome, as a friend it puts a lump in your throat to seeing that guy like him go in. He's one of the best teammates you could ask for" Knight said. "When he came in, it definitely gave everyone goosebumps on the bench and on the ice." It was the last home game for Maris, one of the last in the WCHA for UND; Maris did get his save-- having his career GAA at 0.00 and his save percentage at 1.000%; a great stat line for a guy who wasn't sure if he was going to record any. Towards the end of his scrum, Maris asked the inevitable question many first-timers seem to ask, "Am I doing a good job?? I'm new to this." By the love that UND fans and those associated with the organization gave to him during his appearance-- I'd say he was doing just fine. Quotes and stats provided by UNDSports.com and SID Jayson Hajdu. When it comes to heroes, this week's AGM could be considered one. Not for his work on the ice, though, but what he did off of it. Serving his country was something that may have put a hiccup in his professional hockey career, but what he did during the war was something more spectacular and notable. This week, the profile of Jack Gelineau. Gelineau started his trek in the high schools of Quebec with Montreal Catholic High in the 1942-43 season before going to juniors in 1943-44 with the Toronto Young Rangers, putting together a 1-9-1 record in 11 games, while also playing four games for the Toronto CIL of the Toronto Midget League, going 0-4-0. Towards the end of the 1943-44 campaign, Gelineau went into the Royal Canadian Air Force and would play out the rest of the year for the Toronto RCAF, going 5-2-0 in seven games, then 0-1 in the playoffs. Gelineau would move to the Montreal RCAF in the 1944-45 season, playing in only eight games and five in the playoffs. Gelineau would be discharged from the RCAF after the war. Due to surviving a plane crash and rescuing a crew member from a fiery plane, Gelineau would get the British Empire Medal for gallantry. At the end of the 1944-45 season, Gelineau would play for the Montreal Jr. Royals for five games and would go 2-3-0. At the start of the 1945-46 season, Gelineau would go to play for McGill University going 13-2-0 in 15 games his first season, while helping McGill win the Queen's Cup. In the 1946-47 season, Gelineau went 10-5-1 in 16 games for McGill, while then going 14-6-0 in 20 games in the 1947-48 season. Gelineau would receive the 1st Forbes Trophy for male athlete of the year at McGill. In his last year with McGill, Gelineau went 3-3-0 in six games before graduating with a Bachelor of Commerce degree. 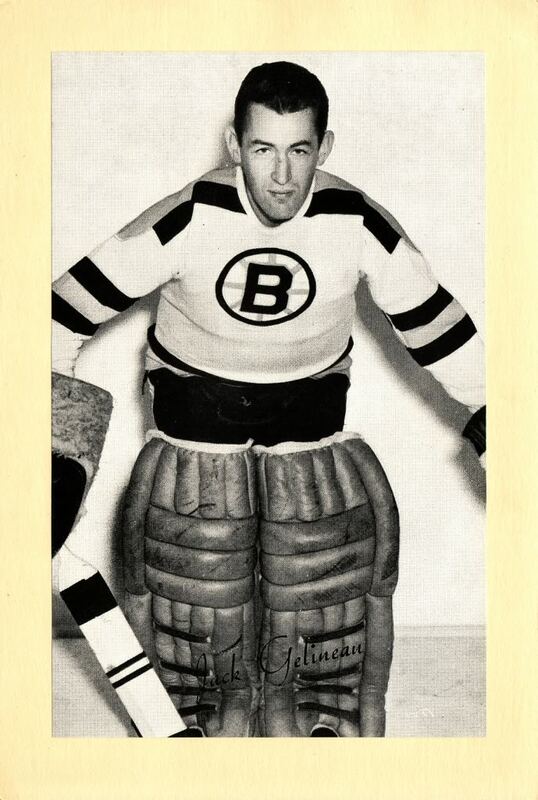 The Boston Bruins picked up Gelineau and played in four games for the Bruins at the end of the 1948-49 season, going 2-2-0. Gelineau went to be the starter of the Bruins for the 1949-50 season, tallying a 22-30-15 record in 67 games, which allowed Gelineau to take home the Calder Trophy for Rookie of the Year. In the 1950-51 season, Gelineau played all 70 games and posted a 22-30-18 record, then 1-2 in three playoff games. Before the 1951-52 season, Gelineau signed with the Quebec Aces-- but still was property of the Bruins in the NHL. With the Aces, Gelineau went 6-4-2 in 12 regular season games and 8-4 in 12 playoff games, helping them win the Quebec Senior League. Gelineau played 21 games in the 1952-53 season, finishing with an 8-9-4 record, then going 13-8 in 21 playoff games. Back with Quebec in the 1953-54 season, Gelineau went 24-27-6 in 57 games, as well as playing 14 playoff games in another Quebec Senior League championship. Also during the 1953-54 season, Gelineau's rights were traded from Boston to the Chicago Blackhawks, where he played for two games and lost them both. 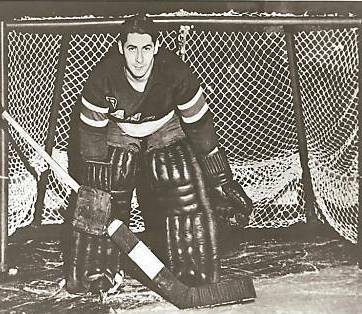 In the 1954-55 season, Gelineau went back to Quebec to play with the Aces and went 4-7-0 in 11 games, then 1-3 in the playoffs before he would hang up the pads for good. Gelineau passed away in November 1998. A hero in the war is what Gelineau should be most noted for. While he did have a brief time in the NHL and some success in the senior leagues, it wasn't as widely noted as his time with the Royal Canadian Air Force. Whether it be the shortened-season or something coming to a head as it was, but the idea of blowing up some teams has been very rampant from this season. Of course, there are some teams that are long overdue for it, as their teams have been in a sinkhole for a while, but these talks have since been escalated with their lack of things happening during this short season. One of the teams who have had a lot of talk behind them recently is the Buffalo Sabres. With Lindy Ruff being canned earlier in the season, you have to think that they are looking for a new kind of look about them. While the free-spending of Terry Pegula hasn't yielded many results-- it does yield talk about whether or not Thomas Vanek and Ryan Miller want to stick around for misfitting puzzle pieces and hope that they work. Those frustrations have one foot out the door with the both of them, the big blow-up happening as soon as this trade deadline, as their return would probably be as high as it ever will be then. Though, while Vanek and Miller are on their way out, the big question is whether GM Darcy Regier will join them. The fact remains that regardless of what parts you move out, if you truly want a full rebuild; you have to get rid of the decision maker Regier in this. Ruff and Regier were there from the same times and you'd think they'd both go down with the ship-- but it seems that Regier somehow found a way to dodge a bullet. 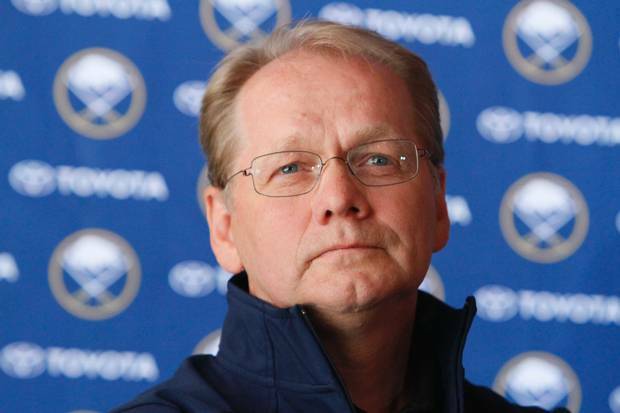 My guess is that he won't dodge it in the summer time, which could create quite the rebuilding ripple for the Sabres. The Calgary Flames are another team that has people wondering if they need to start looking at a solid rebuilding model rather than picking up parts here and there and hoping the playoffs are in the crystal ball. Fact of the matter is that Jarome Iginla and Miikka Kiprusoff are both likely gone from the Flames plans sooner rather than later, either by trades or impending free agency (Kipper still has one more year after this)-- but they are a team in need of a full-rebuild, though it's almost not possible with their minor league affiliate not being as strong as others and draft picks not panning out as well as they thought. With the Flames, you'd think something different would have happened with Jay Feaster taking over, but he seemed to get kneecaps by the contract he inherited. And while you can say the contracts with the No-Movement/Trade Clauses hamper him, there are some player who would probably lift it to get onto a contending team rather than floundering where they are. While many are calling for Feaster's departure, the lack of progress from the prospects can't be completely put on him, but inheriting the prospects or contract or not-- it's his job to move things around and get the right people in there to maybe give a shot to the arm of others. Other teams, namely the Washington Capitals, could probably be looking at a sort of a rebuild-- but they're either too stubborn to do so or think this trend will work itself out. That's not always the case though, as it often takes a big shake-up to actually bring a team back to life and give them an actual turn-around. Drastic times call for drastic measures and there are played time that many teams are way too late in picking up on their teams downward spiral. There's a fine line of thinking a team will actually "snap out of it" and noticing a complete collapse, but it's picking up on that certain thing that separates the good GM and a great GM....and also helps them keep their job as well. In this week's AGM-- many things to be taken away were the disorganization of his organizations goaltending situations could be the reason for his career demise. However, if nothing else can be taken away, this week's AGM was involved in two franchise relocations while he was on the roster. This week, the profile of Tim Bernhardt. Starting in the 1974-75 season, Bernhardt got started with the Sarnia Army Vets Junior A team, but would soon move onto the QMJHL to play for the Cornwall Royals, where Bernhardt finished the 1975-76 season with a 24-16-9 record in 50 games, then a 4-4 record in the playoffs. In the 1976-77 season, Bernhardt played in 44 games and finished with a 24-12-6, then going 4-5-3 in 12 playoff games (ties happened in the QMJHL playoffs, with goals counting toward the final total). During the 1977-78 season, Bernhardt recorded a 35-13-5, then went 5-4 in the playoffs; as well as playing in the World Juniors for Canada, in which they would take home a Bronze Medal. The 1978 Draft saw Bernhardt selected by the Atlanta Flames in the 3rd Round, which placed him in the minor league Tulsa Oilers of the Central League for the 1978-79 season, posting a 15-26-3 record in 46 games. Staying in the Central League, but with the Birmingham Bulls in the 1979-80 season, Bernhardt had a 15-16-1 record in 34 games, then 1-2 in the playoffs. Back with Birmingham in the 1980-81 season, Bernhardt had a 11-13-2 record, but in the 1981-82 season; Bernhardt played only 10 games in the Central League with the Oklahoma City Stars (1-8-0), before getting a call-up to the AHL and the Rochester Americans, playing in 29 games with a 15-10-2 record with a 4-3 record in nine playoff games. In the 1982-83 season, Bernhardt spent most of his time back in the Central League, but with the Colorado Flames, compiling a 19-11-1 record in 34 games, then going 2-3 in the playoffs. Also that season, Bernhardt got the call-up to Calgary, where he would go 0-5-0 in six appearances with the Flames. The Flames did not give Bernhardt a contract after that season, so he went to the AHL and signed on with the St. Catherines Saints for the 1983-84 season, putting together a 25-13-4 record in 42 games, then 2-3 in the playoffs. Bernhardt played 14 games with St. Catherines in the 1984-85 season (5-7-2) before having the Toronto Maple Leafs sign him, where he would spend the rest of the season for 37 games (13-19-4). Bernhardt started the 1985-86 season in Toronto, playing in 23 games, but going a dismal 4-12-3; thus earning him a trip back to St. Catherines, where he would put up a 6-4-2 record, then going 0-3 in the playoffs. 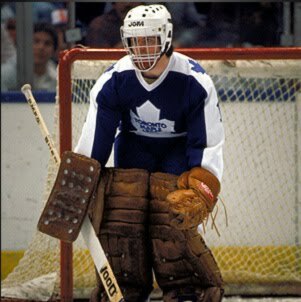 With the 1986-87 season, the Saints moved to Newmarket, where Bernhardt would go 6-17-0 in 31 games, while also appearing in relief for one Maple Leafs' game. For the 1987-88 season, Bernhardt was back in Newmarket, posting a 22-19-4 in 49 games, while in the 1988-89 season-- he would put together a 17-16-2 record in 37 games. Closing out in the 1989-90 season, Bernhardt would only play in 14 games and have a 4-7-1 record for his duties. After that season, Bernhardt would hang up his pads. After hockey, Bernhardt went into scouting-- joining the Dallas Stars staff in 1993, being promoted to Director of Amateur Scouting in 1998, but let go by the team in 2011. While stuck in the minor and then trying to get through the Ballard years in net for the Maple Leafs, Bernhardt didn't get a too much a chance to shine when he was given the chance. While he did have some ups and downs in the minors, the downs may not have been able to be helped considering the organizations he was in. With the NHLPA agreeing to realignment, it's now up to the NHL to actually approve it and for it all to actually go into effect for the 2013-14 season. As the NHLPA stated, it'll be a two-year starter to be re-evaluated; which could also be the timeline to see if expansion could be a viable option for the league. While the realignment will bring about uneven conferences (16 in the East, 14 in the West), there are many more positives than negatives to come out of it. First, this could have saved the Columbus Blue Jackets. They are a team who have been floundering in the West for years, and while they have been marginally better against Eastern teams (83-76-28 as per Aaron Portzline's Twitter); the travelling for the Jackets will be less strenuous (on the team and the finances), the fans of visiting teams will be more available to travel to Columbus with Detroit, Toronto, Pittsburgh, and Buffalo within a somewhat reasonable drive for a road trip-- albeit somewhat longer than usual, it's a fun drive (from Baltimore it was, at least), and it could give the Blue Jackets a puncher's chance of being in the top three of the division or getting one of the Wild Card spots. That's the second one, the playoff format will bring more of a revenue stream to the NHL, helping the financial health of the league. Basically, in both conferences-- the top three in their division will be in the playoffs and the other spots to "Wild Card" team, which will also bring back the divisional play-out to get to the Conference finals. The Wild Card teams will be the two best records in the conference who don't have a playoff spot and the worst record Wild Card team will play the top record Division team. Many loved the old-school model of Divisional play meaning something-- for more than just being the top in the Division in order to get a top-three seed in the playoffs. A final one for me is the regionality of it all....minus the Florida teams who really get hooped in all of this. Yet, aside from the rest of that division having a tractor beam bring up the Florida teams, all of the other teams are regionally based, which will create an increased rivalry for most teams. 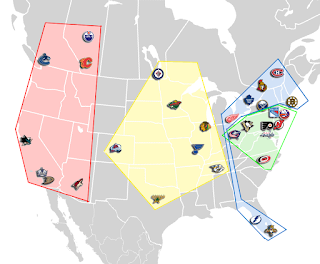 Granted, while most teams in the old Northeast Division are intact, teams like the Red Wings will join that fray; plus the Caps are back in the old Patrick Division, which is where most of their hatred for the Pens and Flyers first sparked up. Though, many in the West are as spread out as always, they have a little bit more condensing, though the Red Wings leave the Blackhawks out to dry in terms of the rivalry deal. Overall and obviously, this is a good thing for the game. It brings some rivals back together, maybe creates some new ones, and only really breaks up one big-time Original Six rivalry. As well, it leaves the Expansion Card to be used to even out the conferences, though they'll have to realign again if there are not two Western markets to compensate-- especially since Seattle is the only real legitimate West Coast market that has been teasing the thought of a team. This experiment will get two years, but here's to the hope that it continues beyond that. This week's AGM is a guy who got passed around from team to team, but never got traded once. He played in a time where injury and war stripped many teams of their players and goalies-- which is where a back-up or third-string goalie would not only provide depth, but also give options for other teams. This week, the profile of Jimmy Franks. Franks started in the South Saskatoon Junior League with the Regina Pats, playing in two regular season games in the 1932-33 season before helping the Pats get to the Memorial Cup finals with a 7-3-3 record, but going 0-2 in the Memorial Cup Finals to lose to the Newmarket Redmen. The 1933-34 season had Franks stay in the SSJHL, but with the Melville Millionaires, but he would be in the Junior "A" league in the 1934-35 season with the Kerrobert Tigers. With Franks advancing to the Senior Leagues, he moved to the Prince Albert Mintos of the North Saskatchewan Senior League for the 1935-36 season, playing in 18 games with an 11-6-1 record, then going 5-2 in seven games of the Allan Cup playoffs. The Detroit Red Wings signed Franks in May of 1936 and put him in the AHL with the Pittsburgh Hornets in the 1936-37 season, playing 20 games and finishing with a 8-9-3 record, then going 1-0 in the playoffs. However, due to an injury to goalie Normie Smith; Franks got called up to the Red Wings for the playoffs-- lossing his only appearance, but still got his name engraved on the Stanley Cup that the Red Wings won. Franks returned to Pittsburgh for the 1937-38 season, going 3-4-2 in nine games, while winning his only game as a call-up to the Red Wings. Franks again returned to Pittsburgh for the 1938-39 season, sporting a 16-14-3 record in the 33 games he played, as well as playing a game with the Syracuse Stars in the AHL (a tie) and four games with the AHA's Kansas City Greyhounds (3-1-0). Staying in the AHL, Franks played for the Indianapolis Capitols for the 1939-40 season, playing for 29 game and finishing with a 16-7-6 record. Staying in Indianapolis for the 1940-41 season, Franks played in 56 games and compiled a record of 17-28-11. In the 1941-42 season, Franks returned to the AHA and played for the Omaha Knights and went 19-14-6 in 39 games and then a perfect 8-0 in the playoffs to win the last AHA championship, the Harry T. Sinclair Trophy. It was an odd 1942-43 season as Franks was loaned out to the New York Rangers by the Red Wings as a war-time replacement for Jim Henry. With the Rangers, Franks played in 23 games and posted a 5-14-4 record. Also that season, Franks played with the Pittsburgh Hornets of the AHL and had a 1-3-0 record in four games of work. For the 1943-44 season, the Red Wings and Franks were at odds at Franks' demotion, leading the Red Wings to suspend Franks for not reporting to Indianapolis. At the end, Franks was able to agree to playing just road games for the Red Wings, going 6-8-3 in 17 games, while also being loaned out to the Boston Bruins for a game against the Red Wings, where he would lose the game to his own team. Franks also spent a game with the Buffalo Bisons, which was a win. Franks played for the AHL's St. Louis Flyers for the bulk of the 1944-45 season, going 5-21-3 in 29 games, while also tying the only game he played in for the Buffalo Bisons. At the end of the season, Franks would retire. Franks would pass away in 1994 at age 79. 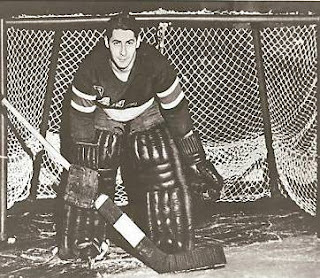 With so little spots around, Franks was able to get into some games because of war-time and due to other goalies being injured. In that kind of cut-throat time, he was able to get whatever he could get and while he didn't thrive in those times, he was able to make his mark in some way, shape, or form. Something I've been hearing, and Glenn Healy hammered it home Saturday afternoon, is that there are many people who still refer to the Winnipeg Jets as the Atlanta Thrashers, mostly for their craptastic playing style and their streakiness that has come to be. It makes me wonder why this has been such a wide-spread thing and how come other teams weren't given as much flack about who they used to be after a move. For instance, you didn't see people rag on the Avalanche for playing like the old Nordiques, but they had the benefit of scoring one of the best goalies in our era in a trade and winning the Stanley Cup their first year in Denver, which almost all but erased the Nordiques from their history.....literally. The Stars and the Hurricanes don't get the look back at the North Stars and Whalers, but both have won a Cup and both really have a lot of different cogs from when they moved to Dallas and Raleigh. Hell, even the Phoenix Coyotes don't draw the parallels to the old Winnipeg Jets, unless it was to bring up the past of the franchise never making it past the 1st round of the playoff for the longest time, until last season. The last team to really get razzed for their organization is Wayne Gretzky calling the New Jersey Devils a "Mickey Mouse Organization." Whether that had anything to do with them moving from Kansas to Colorado to New Jersey, who knows-- but it could possibly be. But what makes these new Jets the target of the relocation fodder?? Is it due to many of the parts from the Thrashers still being there or is it due to so many people being connected and it living on by a word being spoken, thus triggering a memory?? It could be all of it or none of it, but it's hard for these Jets to actually get a true identity with the Thrashers comparison looming over them. Even with their local writers comparing them to their former selves, it's hard for them to avoid it. Of course, to think that it'd be a quick fix is a daunting task. In fact, they play more of a disadvantage with the division they play in, the conference they are in, and the players they still get into their organization. You'll get those kind of things when you don't make that huge splash on the ice that was made off the ice. While True North Sports and Entertainment may have a path they want to take, in a "What have you done for me lately" world, it's not going to be enough-- especially with the crazed fans pining for a team to come back having to deal with these growing pains. Maybe the thought of them still being the Thrashers would motivate them, but it seems that the minute the lose that mantra, something always brings them back down. It may take a five-year cycle for them to actually get going and getting their own identity, but I'm sure they'll get to where they want to be-- especially if they can take advantage of the realignment and not having to travel as often as they do now. 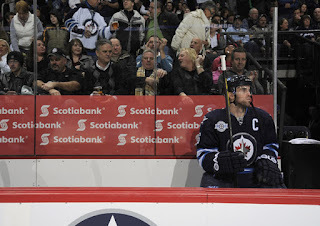 Until then, the carry-over players (Andrew Ladd, Evander Kane, Dustin Byfuglien, Ondrej Pavelec, et al.) will have to do their best to exorcise the demons that haunt them from their short times in Hot-lanta. If they truly want to put an identity out there for themselves, they'll find a way.